All butter puff pastry, with seasoned pork sausage meat, smoked bacon and vintage cheddar cheese filling. 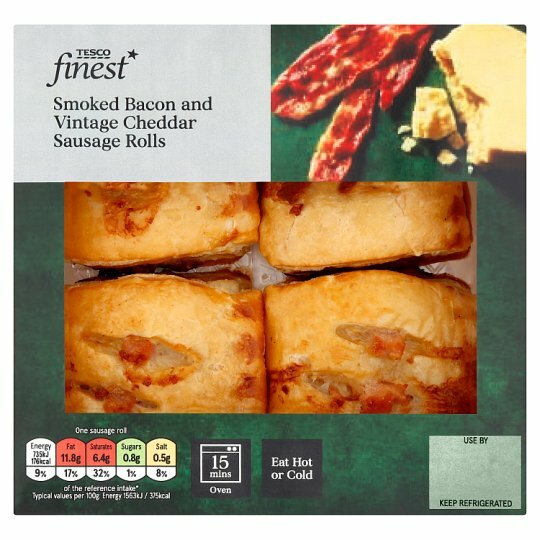 British smoked bacon, vintage Cheddar in all butter pastry. Our chefs have chosen an all butter pastry for our sausage rolls to create a rich, flaky, puff pastry. Carefully selected cuts of British pork are coarsely minced for a meaty texture and expertly combined with the finest ingredients. INGREDIENTS: Wheat Flour (Wheat Flour, Calcium Carbonate, Iron, Niacin, Thiamin), Butter (Milk) (19%), Smoked Maple Cured Bacon (12%)(Pork, Water, Salt, Maple Syrup, Antioxidant (Sodium Ascorbate), Preservative (Sodium Nitrite)), Pork (12%), Smoked Dry Cure Bacon (7%)(Pork, Salt, Sugar, Preservative (Sodium Nitrite, Sodium Nitrate), Antioxidant (Sodium Ascorbate)), Vintage Cheddar Cheese (Milk) (7%), Low Fat Soft Cheese (Milk), Onion, Pasteurised Egg, Cornflour, Salt, Black Pepper, Potato Starch.